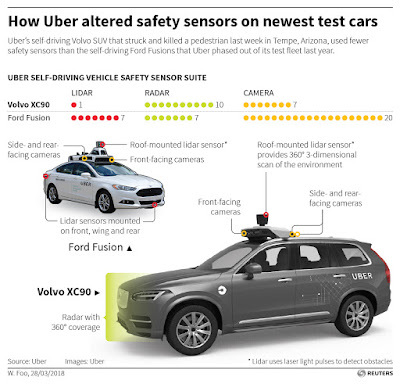 "Autonomous vehicles operated by rivals Waymo, Alphabet Inc’s self-driving vehicle unit, have six lidar sensors, while General Motors Co’s vehicle contains five, according to information from the companies. The safety of Uber’s self-driving car program is under intense scrutiny since Elaine Herzberg, 49, was killed last week after an Uber Volvo XC90 SUV operating in autonomous mode struck and killed her while she was jaywalking with her bicycle in Tempe, Arizona." 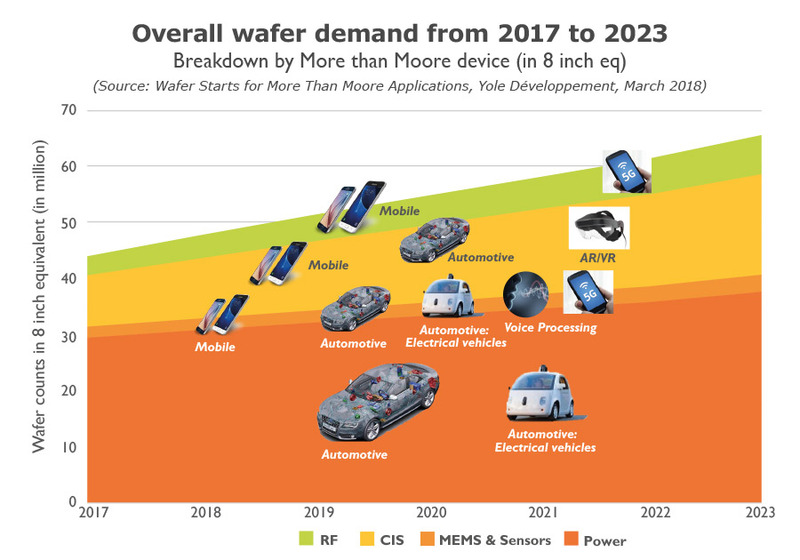 BusinessWire: Cepton Technologies unveils its Vista LiDAR sensor, said to deliver the best-in-class performance to the automotive market when compared to current LiDAR technologies. The 120-line-equivalent scanner delivers 200 meters of range and 0.2 degrees of spatial resolution. The Vista LiDAR is significantly smaller than most solutions on the market and uses fewer than 10 watts of power. Cepton - Vista LiDAR Introduction from Cepton Technologies on Vimeo. "Pixel with thin gate oxide narrow pmos amplifier has the lowest noise. Because of process variation, even the same kind of pixels has some noise difference. For pixels with thin gate oxide narrow pmos amplifier, the best pixel can reach 0.21 e-RMS read noise." 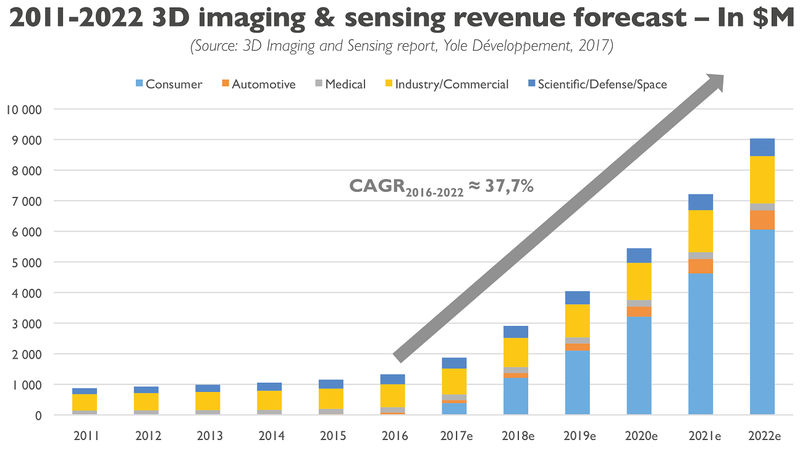 "A report from Goldman Sachs Global Investment Research predicts that the market opportunity for lidar in automotive will grow from zero in 2015 to $10 billion by 2025, and $35 billion by 2030. 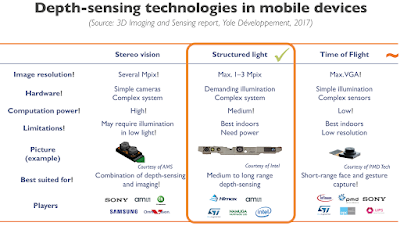 Oren Rosenzweig, co-founder of Israeli lidar system maker Innoviz Technologies, said at Image Sensors that the cost of lidar is prohibitive, and the performance is not good enough. 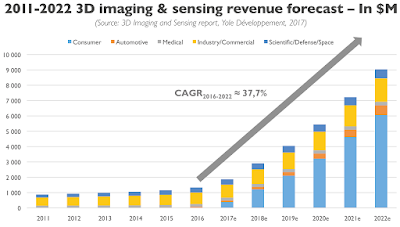 Rosenzweig, speaking to Imaging and Machine Vision Europe at the show, said that $1,000 per lidar system might be acceptable for certain early adopters of the technology, but that hundreds of dollars per lidar was needed to make it attractive to automotive OEMs. As the volumes increase, however, then costs will go down. 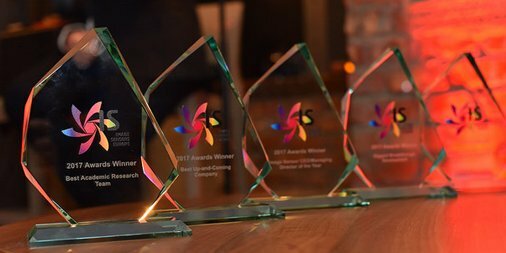 Innoviz’s technology is a solid-state lidar combining a MEMS scanner based on a micro-mirror designed by the company; the signal is processed in a proprietary ASIC. The Innoviz One has a 250-metre detection range, an angular resolution of 0.1 x 0.1 degrees, a frame rate of 25fps, and a depth accuracy of 3cm. The device is based on 905nm laser light; 1,550nm would cost too much for the lasers and detectors, Rosenzweig said. 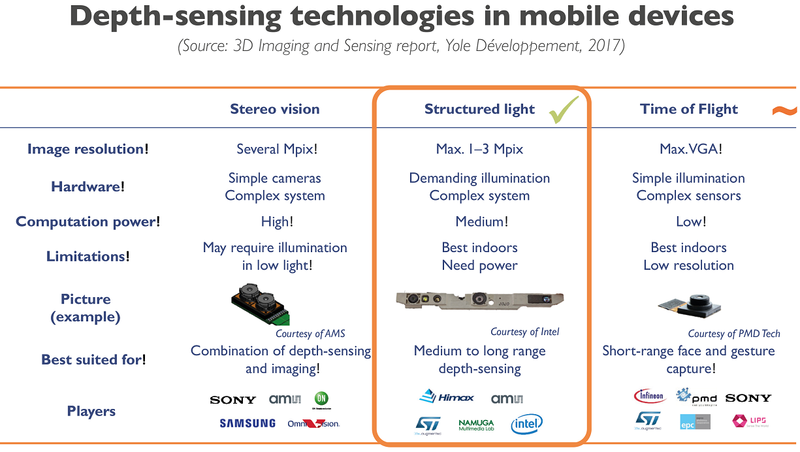 Solid-state lidar uses primarily 905nm lasers, according to Carl Jackson, founder and CTO of SensL, although he added that 940nm VCSEL arrays are also being developed. 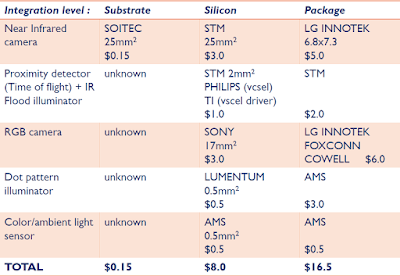 Jackson said that SiPMs or a SiPM array can improve sensitivity and ranging compared to avalanche photodiodes (APDs). SensL’s first product for lidar is a 400 x 100 ToF SPAD array with high dynamic range SPAD pixels, optimised for vertical line scanning. It will be sampling in the second half of 2018. Jackson said that the sensor array can be used to create a lidar solution with 0.1 degree x-y resolution, suitable for greater than 100-metre ranging at 10 per cent reflectivity in full sunlight. Jackson also noted that VGA-quality SPAD arrays could be available next year. Eye-safety is all about the design of the system, according to Jackson. He said that a laser pulse of 1ns from a 5mm aperture at 30 degrees angle of view in the y direction can reach 26,908W of power and still be eye safe, ‘which is plenty of power to do long-range lidar with 905nm’. He added that a 120 x 30-degree system will need 6,000W of laser power to achieve 200-metre ranging with SiPM technology." OSA Optics Letters issue dated by April 1st, 2018 publishes Peking University, China, KAIST and KRISS, Korea paper "Time-of-flight detection of femtosecond laser pulses for precise measurement of large microelectronic step height." 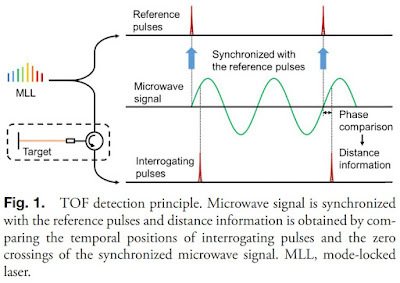 "By using time-of-flight detection with fiber-loop optical-microwave phase detectors, precise measurement of large step height is realized. 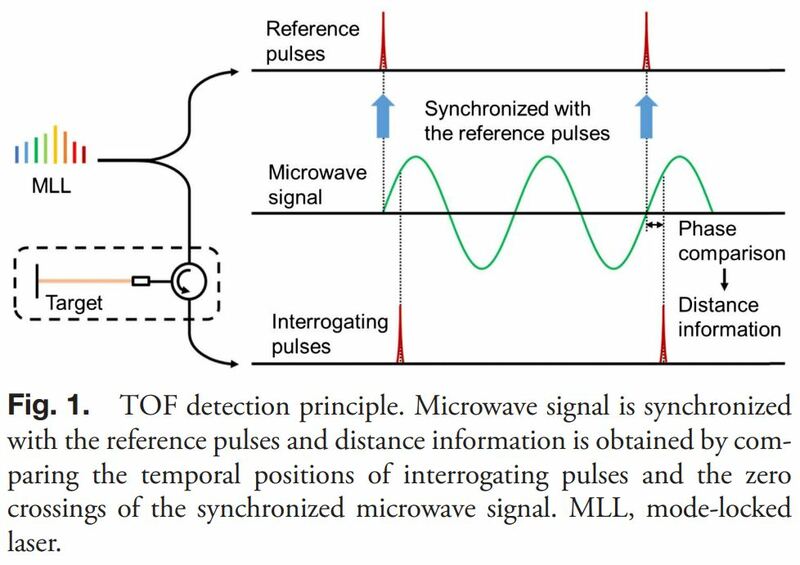 The proposed method shows uncertainties of 15 nm and 6.5 nm at sampling periods of 40 ms and 800 ms, respectively. This method employs only one free-running femtosecond mode-locked laser and requires no scanning of laser repetition rate, making it easier to operate. Precise measurements of 6 μm and 0.5 mm step heights have been demonstrated, which show good functionality of this method for measurement of step heights."